With many people now having multiple Macs and phones, keeping them in sync can be a bit of a pain. You could use MobileMe to keep some things the same across machines, but there are more flexible options available. SyncMate 3.0 doesn't just sync phones or Macs – it can keep a whole host of devices and services singing from the same hymn sheet. As well as syncing things like Contacts, Safari Bookmarks and Mail Notes, it can manage iPhoto and iTunes accounts between not only Macs, but also PCs. It's not just devices either, as you can sync services such as Google calendars and contacts too. But the big addition to SyncMate 3.0 is Android support. Not every Mac owner has an iPhone and the Android system is a perfectly good platform. 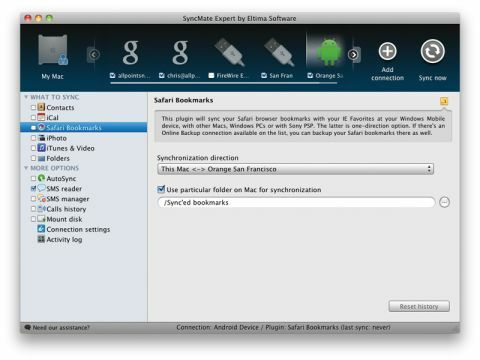 However, for obvious reasons Apple doesn't make it simple to keep your Android phone in sync with your Mac. This app is the answer: just plug your device in, wait for SyncMate to recognise it and choose what to sync between the two. If you're an Android user looking for a simple method of letting your phone and Mac play nice together, SyncMate really helps. You can sync over plain old USB or use Wi-Fi or Bluetooth connections. As well as the paid-for version there's a free edition that allows you to get an idea of what it can do. If you have an Android device or lots of different Macs and PCs that you'd like to keep in sync then this is an excellent tool to help you.